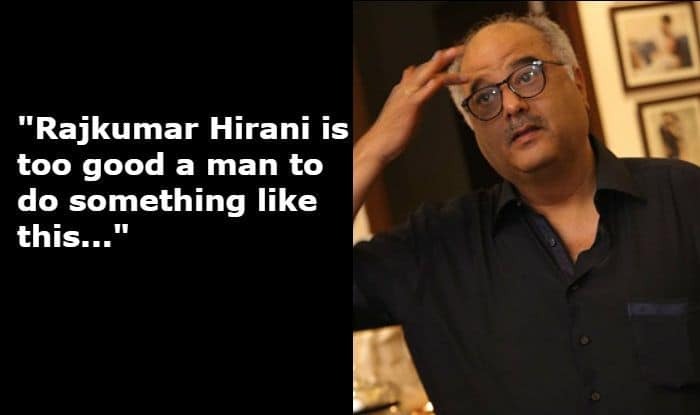 Film producer Boney Kapoor has come out in support of filmmaker Rajkumar Hirani after he got accused of sexual harassment by an assistant working on his film Sanju. Kapoor said he is in shock ever since the allegations have surfaced and he doesn’t believe Hirani could harm anyone. Kapoor in his statement to ANI said, “Rajkumar Hirani is too good a man to do something like this. I don’t believe this allegation. He can never do something like this”. Earlier, even actor Sharman Joshi expressed his stance on the matter and said Hirani is a man of integrity and character and that he stands with the filmmaker in this difficult phase. He tweeted, “Raju Sir is a man of immense integrity, character, honour, compassion and truthfulness, all the virtues one would imagine are non-existent in people today, someone I am absolutely inspired by and have learnt from and because of whom I believe I have gone onto being a better person. All I want to say, Sir is that this too shall pass. I can imagine how demeaning it might be to even stand up for yourself in a situation such as this” (sic). He made the statement using ‘I Stand For Raju Hirani’ hashtag on Twitter.